Back in the summer of 2007 when our PC-2350 was new, we had a truck suspension shop do some suspension upgrades to improve handling. That was 11 years and 36,000 miles prior. The previous two trips, I noticed the front of our rig porpoising, bouncing up and down for any little reason. This past summer I inspected the front shocks, quickly discovering a problem. I jacked up the front of the rig using my floor jack as shown. I looked at the top of the front shocks and seen this. Note the raw steel stem and the gap between the vehicle and the rubber bushing. There should be no play between bushing and vehicle. 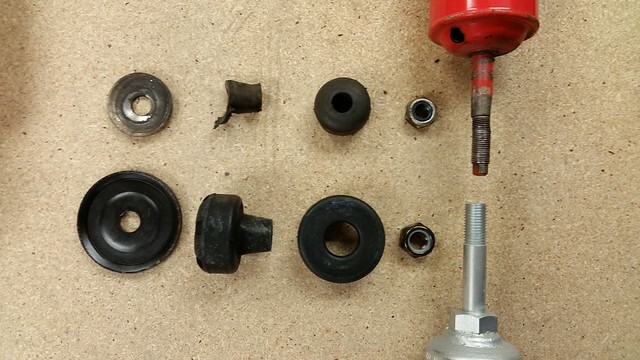 The reason for the gap was that the top rubber bushing had completely worn away. 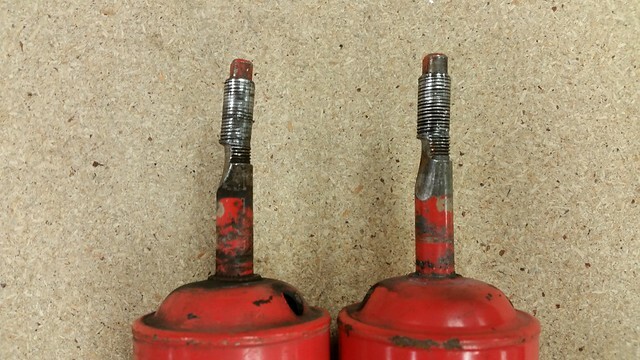 This happened to both front shocks. 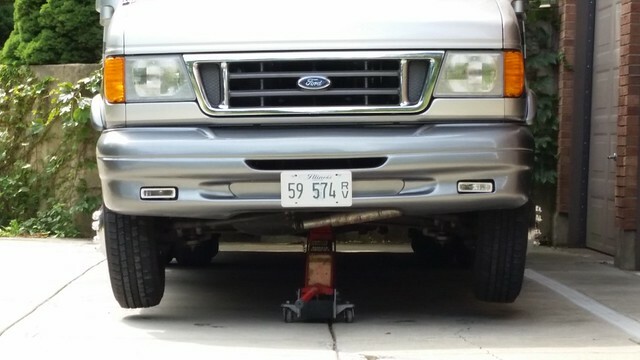 I really wanted the high tech Koni-FSD shocks, but they were terribly expensive and did NOT offer a life time warranty. 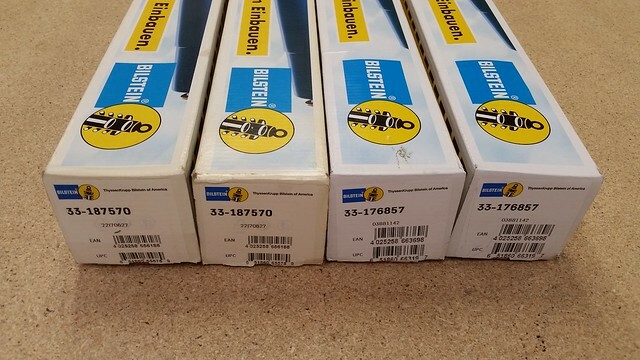 So I went with affordable Bilstein heavy duty shocks with a life time warranty, bought from Tire Rack. 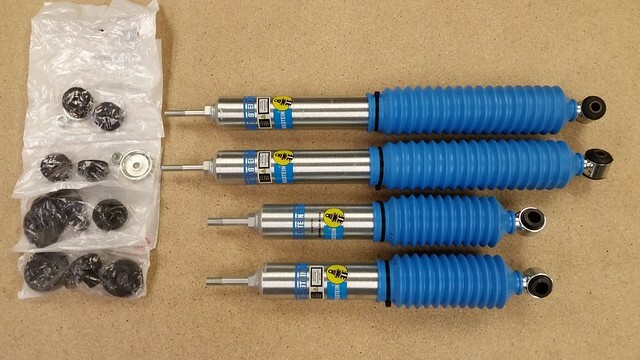 I removed our old Koni-RV adjustable shocks and compared them to the new Bilstein Heavy Duty shocks. Note where the failure occurred. The shocks worked but the top rubber grommet disintegrated. Compare the difference in the size of hardware between the Koni and Bilstein-HD. The Bilstein-HD is massive by comparison. Also note the thickness of the stem. The Koni-RV stem is thinner than on the Bilstein-HD. The movement from the worn-away top rubber grommets damaged the stems of the Koni shocks, requiring the shocks themselves to be replaced. Fortunately all the wear was on the shock, not the vehicle mounting hole. For general comparison, here are the two brands side by side. Interesting to note, the Bilstein shock is inverted, it's upside-down. This was done for the shock to better clear the vehicle frame. 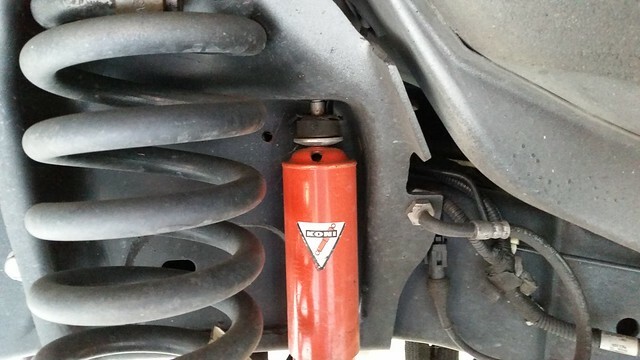 Note the abrasion on the red painted side of the Koni shock from rubbing on the vehicle frame. The tight clearance condition likely caused the abrasion as the top rubber grommet was wearing away. Replacing the driver front shock is challenging by the experienced mechanic. 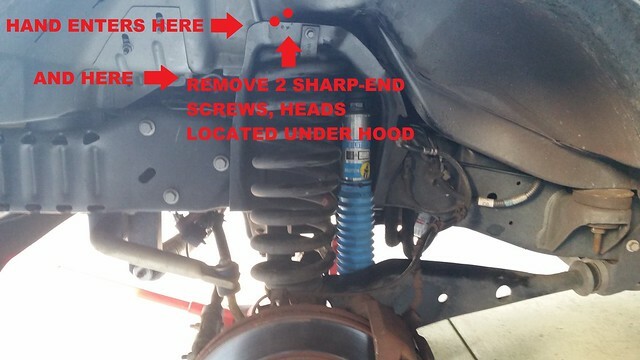 I discovered two ideal places to access the top of the shock by following this procedure. My hand and tool passed through both areas fairly successfully. I first tried the access port via a grommet in the driver's floor pan but found this much easier for me. My rear Koni shocks were fine, but I wanted everything matching. 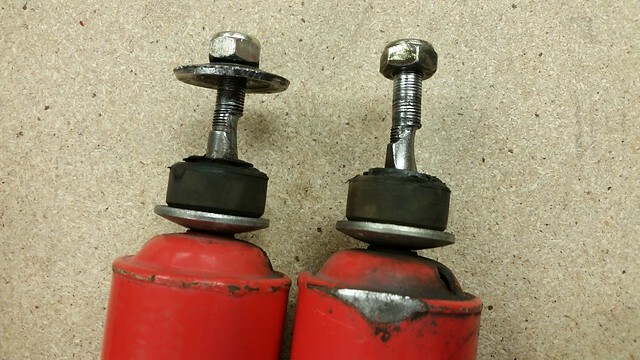 I was able to replace both rear shocks without lifting the rear of the motor home. The 4 rear tires were not disturbed. There is a heat shield above the top mount on the passenger side. I wedged a piece of lumber between the heat shield and vehicle frame to raise it up to improve the work area. I took a "Leap Of Faith" switching to heavy duty Bilstein shocks. I was very concerned the quality of the ride would be compromised from their "heavy duty" rating. During our proceeding vacation out west, about a 4000 mile round trip journey, I paid very close attention to "harshness of ride". It is so little of a change that I had to concentrate to notice anything, if anything at all. As for the quality of the ride in other ways, specifically handling, in all fairness to the Koni's, the front top shock grommets were worn away, and all were not adjusted to the same setting. So how can a comparison be made? But I can say that the porpoising is 100% gone and the handling is greatly improved. If doing it all again a second time, I would make the exact same choices. So for the sake of a much lower purchase price, a lifetime warranty, durability with massive rubber grommets, supporting washers and stems, the inverted design to improve clearance to the vehicle frame, the Bilstein-HD shocks is my winner. I only wished I had the terribly expensive gold Koni-FSD shocks "on-hand" for comparison. One more thing worth mentioning. Done with both with the old and new shocks, I jacked up the front and dropped it to the ground by quickly releasing the jack. With the old shocks, our rig bounced like a ball, coming to a halt after many ups-n-downs. With the new shocks, it fell, came up, went down, and rested just as it should. Thanks for the insight. They can sure keep the visible part of the shock looking good, it's what you can't see that counts. I have the same Koni"s, do I assume they were not stock from PC? We have no records from the original owners, unfortunately. Our steering stabilizer appears to be nothing fancy, likely original, and we have about the same mileage, 33k. Only a very slight wander to chase going down the road...can that be totally eliminated? I used to have a floor jack that big, no more, good excuse to let a pro take a look! Keep those tips and comments coming! Love it! Your red Koni shocks were installed after the rig left Phoenix. People don't know this, but they are adjustable. In my case, the shop who sold them and installed them, just took them out of the box and installed them without setting them to a specific setting. This resulted in unmatched settings. 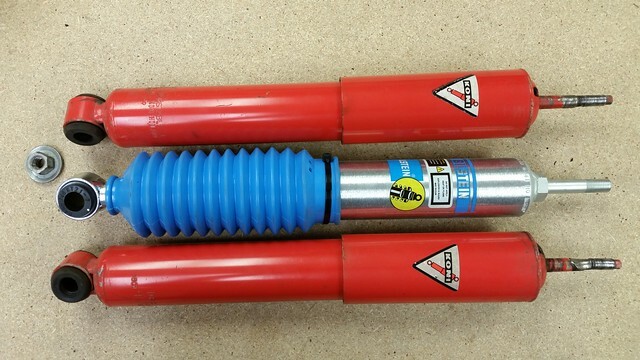 If your shocks are not damaged like mine were, I would make sure they are all set to the "heavy duty" setting. Doing so may correct your "wander". The red Koni shocks are set as follows. 2) compress the shock all the way in. It will stay in the position you compress it to. Unscrewing the shock all the way while compressed sets the shock to it's least effective setting. You count the turns if setting it somewhere in between, but you will surely want the shock set to it's max effectiveness. Don't worry about the harshness of ride because set to max will still be less than the heavy duty Bilstein shocks I replaced mine with. When changing the setting, first confirm what I am saying on one shock. First unscrew it all the way and see how easy the shock is compressed. Then set it to "max" and see how difficult the shock is to compress. I keep having to relearn the lesson of doing as much as I can myself. I can't even trust the "expert" truck & RV suspension shop to properly install and adjust the shocks they sold me. I used to recommend them until this revelation which explains a few unexplained oddities including the failed Koni top bushings. I won't go back there for any service except for a front wheel alignment because they are the rare few people around here that handles such vehicles.